“When a golfer is afraid, he/she doesn’t perceive. The solution to this is simple. Do not do this! 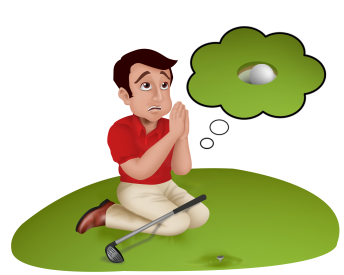 Visualize only what you want to happen with the golf ball and while the results may not happen in the present moment, there is one thing for certain – the results will become more and more towards what you do want and your need to fear will disappear. Back in the early 1970’s when I was starting out on the PGA Tour in Australia and New Zealand, I was practicing my short putts on the practice putting green at St Clair, Dunedin, NZ. I had been there for quite a time when I looked up to see Bob Touhy, a well known great putter, watching me intently. I asked Bob for some advice about my stroke. His reply will always stay with me. Bob Touhy said ” Peter – why worry about your putting stroke, it is not the problem. You will miss some along the way, but don’t blame your putting stroke. 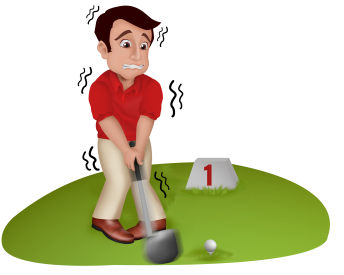 Just decide where to aim and hit the putt – it will either go in or miss! Why worry – the sun will shine again tomorrow. Fear about a missed putt or shot will only bring about more of the same.